The award winning three day event that benefits local charities is back for another year. The festival features Greek food, dancing, beer and more. New this year, the Mikro Half Marathon. The 13.1 miles race is a tribute to Pheidippides, an Ancient Greek hero who ran 26. 2 miles and died. 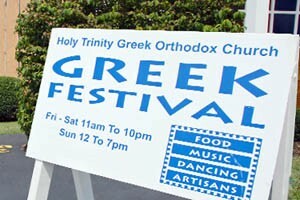 The Greek Festival is today and tomorrow from 11 a.m. to 10 p.m. and Sunday from 12 noon to 7 p.m. at the Holy Trinity Greek Orthodox Church. Admission is free. Click here to see the festival’s website.